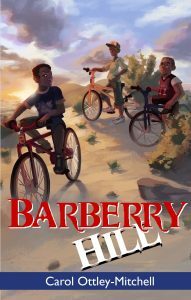 When Rashid is killed in a gang-styled execution on Barberry Hill, everyone in St. Kitts thinks that he must have been a gang banger, but Jaden knows better. With the help of his two best friends, Jaden sets about clearing his brother’s name. But the murderer is not about to let that happen. Can the friends survive the truth? Buy today on Amazon, Kindle, Barnes and Noble, and select bookstores. Fourteen-year-old Jaden has experience with abandonment. All that he has of his mother fits into the barrels of goodies that she sends from the US to St. Kitts where he lives with his grandmother, father, and brother Rashid. But when Rashid is killed in a gang-styled execution right outside their house on the “good” part of Barberry Hill, Jaden’s grandmother dies, and his parents seem even more distant than ever, Jaden is at the end of his rope. The police, his mother, his father, and indeed the entire town seem to agree with the conclusion that Rashid must have been doing something wrong, but Jaden knows better. Rashid was no saint but Jaden is convinced that Rashid would never have been entangled in anything illegal. With the help of his two best friends, dependable MJ and the inscrutable Stein, Jaden pledges to clear his brother’s name. Together the three friends embark on a danger-filled journey that takes them into the clutches of one gang and forces Jaden to face some difficult truths about his relationships with his friends, his family, and his brother.